Shaw Nature Reserve in Gray Summit, MO strives to inspire responsible stewardship of the environment through education, restoration and protection of natural habitats and public enjoyment of the nature world. The opening of a new certified Nature Explore Classroom will help the Reserve accomplish its mission. Climbing areas in Nature Explore Classrooms provide children with a fun way to learn balance and explore nature first hand. The Nature Explore Classroom is situated on a gentle slope within the reserve with the entryway located at the top. With few exceptions, the area is natural and made of material from the Reserve, including fencing, benches, tables, platforms, entry archways, sandbox frames, the stage, balance logs and stepping logs. The crawl-through logs are made of sycamore trees found along a gravel bar inside the Reserve. 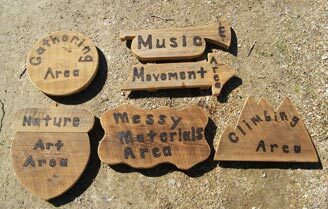 Signs for the activity areas are specially shaped to match the area, and are mounted on cedar posts. 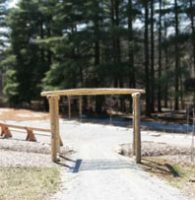 The Nature Explore Classroom uses a variety of techniques to delineate activity areas, such as low plantings of natural shrubs and perennials; pathways; different surfaces such as mulch, pine needles and grass; low walls made of cedar pieces and limestone boulders; and natural fencing. The classroom includes a build-it area with stump tables and chairs and a platform that will hold a storage bin of blocks and tree cookies; a climbing area with multiple balance logs and stumps of varying heights; a messy materials area with two crawl-through logs, two sand pits and a frame made out of bamboo for children to construct a fort; and a music and movement area with a platform and a marimba. Nature Art objects at the Nature Explore Classroom, such as pine cones, small rocks from the gravel bar, and seed pods, are all from the Shaw Nature Reserve. 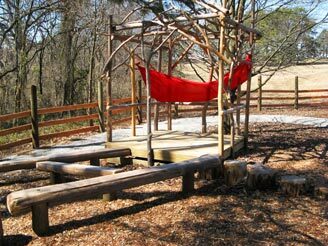 The Shaw Nature Reserve’s Nature Explore Classroom is the second to be constructed in Missouri. Connecting children with nature through personal exploration is the goal of the Nature Explore Classroom at the Shaw Nature Reserve. The messy materials area at the Shaw Nature Reserve Nature Explore Classroom will allow children to enjoy the touch, sound and smell of the natural world. An action area is included in the Nature Explore Classroom, which provides children with an open space for large-motor activities. Native shrubs and grasses are used along the pathways as dividers for the different areas in the Nature Explore Classroom. A stand of white pine trees provide shade for a large portion of the classroom. Platforms, tables, chairs, benches and crawl-through logs are all made of wood that was harvested on the reserve. More than 10,000 school children visit the Shaw Nature Reserve each year.